Solving ancient mysteries isn’t all that hard. When trying to answer the questions posed by ancient events and artifacts there are a few things that are important to consider outside of demonstrable facts to glean their true history when all that remains is speculation. It has become something of a cliche that a discovery will be identified as being religious in nature. That may be true nonetheless for most things pertaining to the ancient world because religion (and the fear that comes with it) is a great method of crowd control. But busy-work building temples is a big-picture kind of thing and doesn’t fill every moment of the day. So how does one puzzle out the practical uses of less expansive ancient technology and artifacts of a culture? One way to do this is think like an ancestor. Life was hard way back when. People scratched for sustenance and if they didn’t gather enough goods or trade enough services for food then they starved that evening. There were a lot of things about day to day life that just were not required for making it to the next sunrise so it was a great investment in time to do anything not absolutely goal-oriented towards survival. So the one trait I speculate that was in wide use by ancient peoples was that of Common Sense. Our ancestors were not stupid. Far from it. They were capable of things that even the most advanced nation of today scratches their collective heads over. Often scholars can’t agree how spectacular ancient engineering feats were accomplished because modern tools can not duplicate exactly the same results. Tales of machines that seem far-fetched can not be recreated using tools of the day. So how did all these wondrous inventions lost to time become reality? By using a common sense approach to any project. Many seemingly impossible things were done simply because a can-do attitude was applied. While the assertion that “thinking outside the box” may seem simplistic that leads to the next trait to be aware of and one that is necessary for the first to work successfully. That is to understand that People Are Bastards. Need to move heavy stones from one place to another? Throw people at them until it gets done. Want to keep the village busy between crop planting? Have them dig furrows in the earth creating pictures only the “Gods” can observe from on high. Strike fear in the populace to keep them under control? Parade a bunch of exotically-armed guards around as your retinue. Some time ago I solved the riddle of the true use of the stone rings in an Aztec courtyard. The common misconception was that opposing teams kicked a ball through a small stone ring high on a wall. This is ridiculous. You can read why here, but suffice to say that any game played in that manner would be frustrating for both players and spectators alike. Foreign visitors reported the elaborate game of skill played by the locals though this was likely exaggerated to make the conquering army seem all the more formidable against the native population. After all, it wouldn’t do to have highly-skilled and technologically advanced soldiers wearing armor defeat a bunch of kids playing volleyball. Though cool, that the weapon worked as effectively as the legend would have it is extremely unlikely. Modern replicas, even those made with materials that would enhance its effectiveness as a throwing weapon more often than not fail spectacularly. While ancient blades would assuredly been strong enough to sever limbs and decapitate a human it is also equally unlikely that the movement of a sharp knife in the space of few inches by yanking a cord or chain would have the desired effect of cleanly lopping off a head. It has also been theorized that since the usefulness of the Flying Guillotine as a throwing weapon is questionable it was used instead to ambush the unwary. The weapon would be dropped over the head of a victim who passed under a tree or arch. While this is more feasible it is yet not very plausible and attributes to ancient martial artists nigh-magical ninja skills that realistically did not exist and would be almost useless and impractical in a real-world situation. 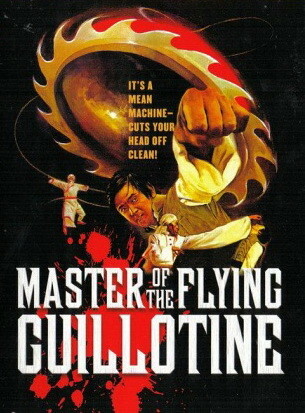 As the tool of an assassin the Flying Guillotine is ridiculously complex. It’s use as described in legend flies against all common sense and is not very practical. Why go to all that effort when it was far easier and economical to just sneak up on someone and hack at the neck with a long blade? Presumably expensive and time-consuming to create and rare enough that making one was strictly controlled by the wealthy and powerful it is more likely that the Flying Guillotine was an artifact that promoted fear among the populace. This is not to assert it was never put to use. it is rare that a weapon is created that is never used. It is the stories and tales of its deadly accuracy by an elite squad of guards that would ensure that anyone would think twice about attacking or disrespecting the Lord of the village. Instant and horrifying fear of death from afar is a great way to ensure someone with designs on the big chair doesn’t gain much support from his fellow disgruntled farmers. The thought that one could be killed at the drop of a hat from twenty feet distant before getting close enough to use a knife would make anyone think twice about rushing the palace. As to its actual practical use it isn’t difficult to imagine that the Flying Guillotine was pressed into service on occasion on some poor person as an object lesson not to mess with the boss. Placed over the head, the victim could be paraded about in public, lead by a chain attached to the device he wore. It was spectacle. Anyone observing some poor fellow staggering about wearing the thing knew he was a dead man walking. When I showed this ad to my Mom she asserted that her school would never have allowed such an icon to be used as a mascot since Sheena was such a provocative female figure. I can only speculate that the parents and faculty of the school of the 1940s didn’t mind as they had friends and family that were used to glamorous pin-ups in the home, workplace and military barracks and a culture that was a little more rough and tumble from years of war and working the shipyards. I don’t know what the long ago class of that high school was like but I can’t help thinking that Sheena would not go over as well today with the students as it may have done in 1947. The image of a Caucasian female dressed in leopard skin as the Queen of an African region would be as more unpopular (though for different reasons) than their current school mascot, what some have called a stereotypical Indian brave. 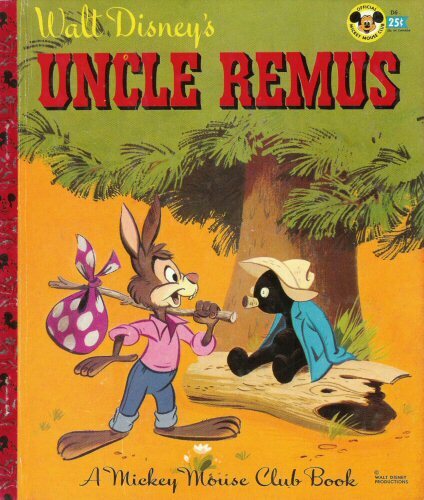 One of the more popular sequences was The Tar Baby, a tale in which the character of Brer Rabbit escapes from predators using reverse-psychology. For the uninitiated and anyone who grew up outside of the South after 1970 the term “Tar Baby” is a pejorative in relation to African-Americans. As a child in the late 60s watching this film in the drive-in I had no idea that the sticky trap represented anything other than what it appeared to be. In the Disney universe of walking, talking intelligent animals I didn’t see anything unusual with Brer Rabbit engaging an inanimate object in conversation and expecting a reply. It is unlikely that the creators and audiences of the 40s thought the same and knew exactly what the sticky trap was supposed to represent, which is only one of the reasons the film was eventually pulled from syndication. 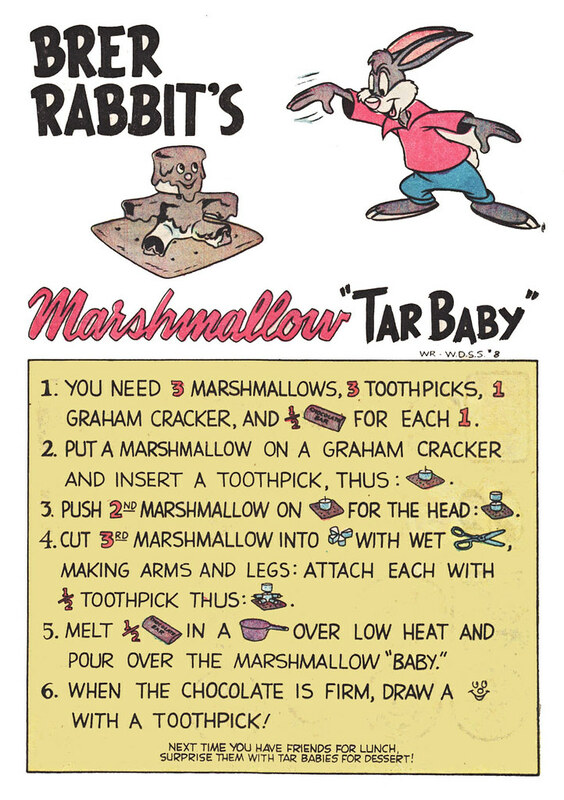 In 1958 Walt Disney’s Silly Symphonies #8, under the Dell imprint, published a recipe for a “Tar Baby” treat as a one page fun feature. 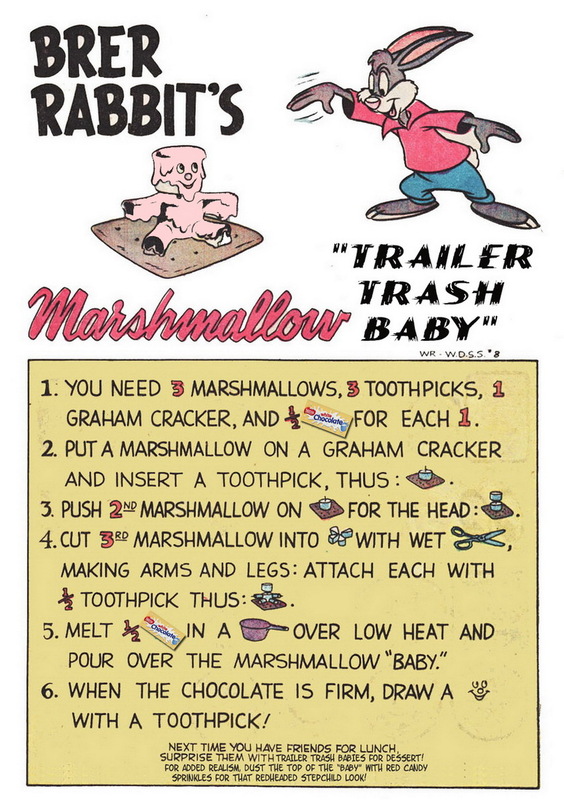 The snack, which kids could make at home or (I shudder to think) school, was a marshmallow creation covered with dark chocolate that resembles the sticky trap that Brer Rabbit ran afoul of in the Song of the South feature. In 1946 sheer ignorance and marketing inertia could explain the promotion of stereotyped caricatures of African-Americans though it would have been a little harder to justify in 1958. It could only have been utter stupidity when the decision was made to include the one-page recipe feature and reprint it in 1975 in Walt Disney’s Showcase #28. By the 1970s everyone involved should have known better. In the interest of parity I changed the recipe to make it more representative of the contemporary South and included it in this post, which you can click on to make double-wide size for easy viewing. For those who prefer the “warts and all” approach to history the original can be viewed here.